Biochemical measurements in acute kidney injury (AKI) cases (□) and controls (□) 1, 2, and 3 d before AKI. Box and whisker plots show that the median urinary IL-18 levels are increased in AKI case patients compared with control subjects at 1 and 2 d before AKI diagnosis by serum creatinine. P value at 1 and 2 d before is <0.001 and 0.03, respectively (Kruskal-Wallis test). Urinary IL-18 values are not significantly different at 3 d before AKI in case patients versus control subjects. 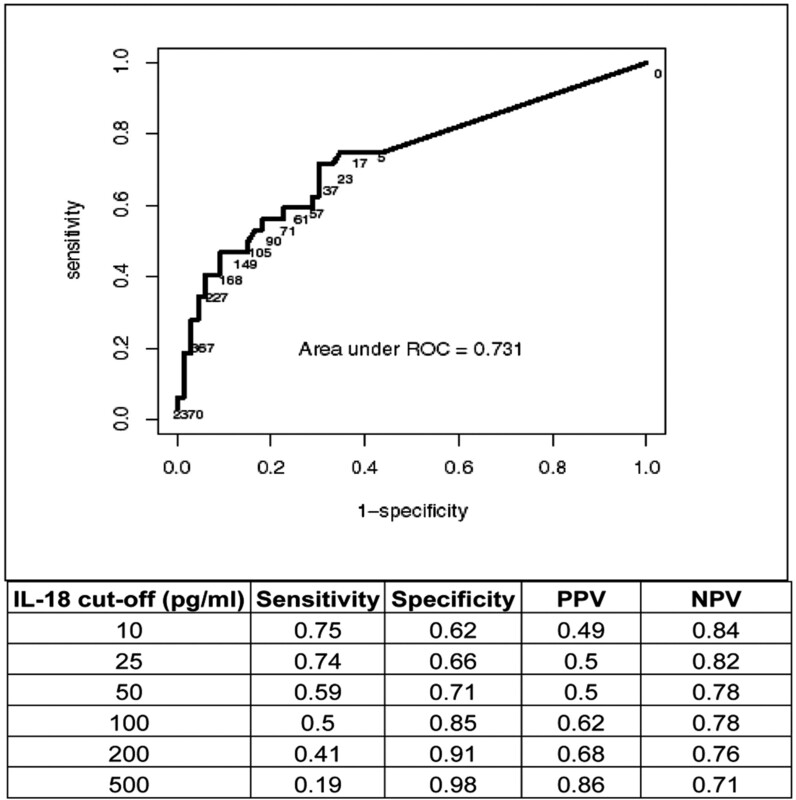 Receiver operating characteristic (ROC) curve and performance characteristics for urine IL-18 measured 1 d before AKI. The area under the ROC curve for the urine IL-18 test is 73%, demonstrating a good performance for the diagnosis of AKI within the next 24 h.
Urine IL-18 levels (mean ± SEM) at baseline, day 1, and day 3 among survivors and nonsurvivors. ↵a AKI, acute kidney injury; APACHE, Acute Physiologic Assessment and Chronic Health Evaluation. ↵a OR, odds ratio; CI, confidence interval. 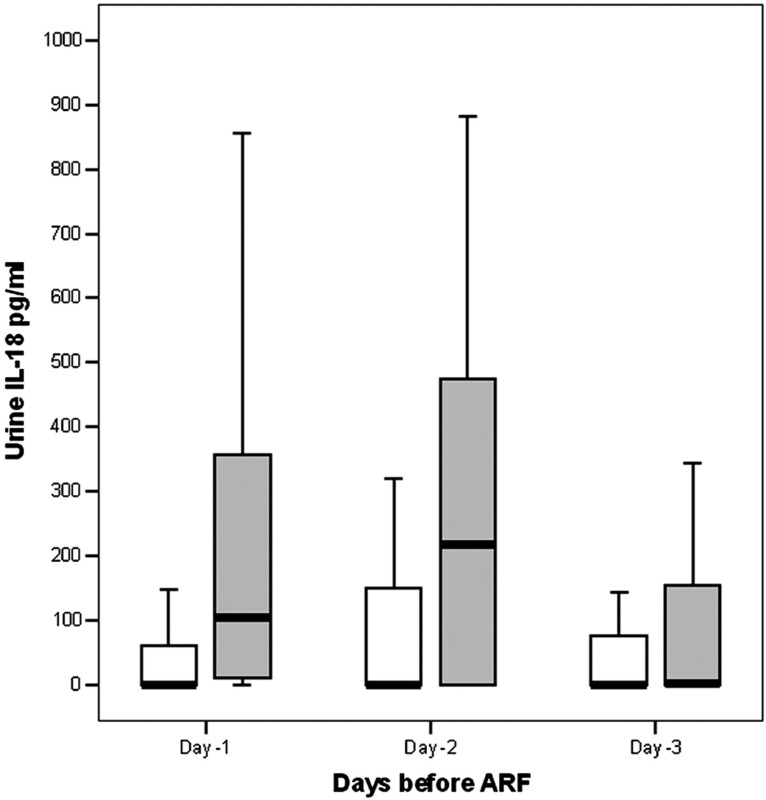 myo-Inositol Oxygenase: A Novel Kidney-Specific Biomarker of Acute Kidney Injury? Acute Kidney Injury: Not Just Acute Renal Failure Anymore?